Excellent aerosol spray kills ants immediately on contact and is effective at controlling the population. This ant dust is effective at getting into hard to reach places like cracks and crevices. This waterproof ant bait is great for killing off large infestations and colonies before they get into the home. Carpenter ants can become quite an issue if not taken care of quickly and effectively. Since you have found this article, I imagine you’re dealing with a pretty severe carpenter ant infestation, and you are looking for a way to tackle it. Carpenter ants are a relatively common issue throughout the United States, and they are small black ants that primarily live in wood. These ants are most common in older homes because they prefer to make their homes in damp dead wood. This carpenter ant killer is a 19oz aerosol spray can that makes this perfect for spraying ant colonies and controlling the population in your yard and around the exterior of your home before they get in. Using the spray can you can spray into hard-to-reach places as deep as 15 feet away. This ant killer works great for spraying in cracks of doors, windows, and cracks in foundations as well. The manufacturer recommends using it outside around the foundation of your home in the early spring when ants try to enter the house. They also recommend it at the beginning of fall. kills ants on contact and lasts for up to eight months on a given area to kill at the ants that come in contact with the dust. This ant killer is applied by simply shaking the can and sprinkling the dust over an infested and high traffic area where carpenter ants are abundant. 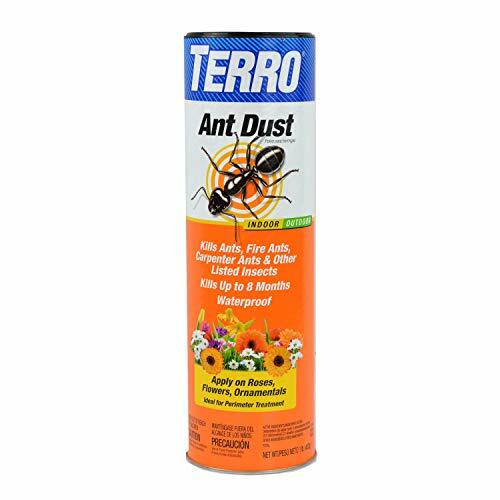 Terro Ant Dust is effective when used in foundation cracks and crevices as well as around hardscaping and pavers. This ant killer works for all kinds of ants and pests including carpenter ants, fire ants, boxelder bugs, cockroaches, and crickets. The best feature of this ant killer is that it will not wash away in the rain so when its applied directly to an ant hill, it is effectively at controlling the ants for up to eight months. This ant killer contains six large pre-filled ant bait areas that are ready to use right out of the box. 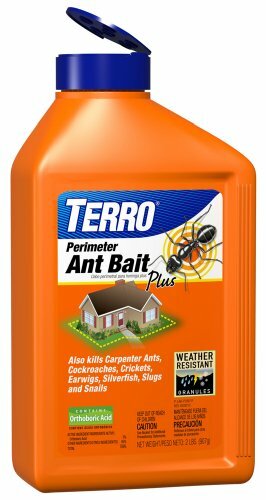 Terro Outdoor Liquid Ant Bait attracts and kills all forms of ants outside the house, so they can’t even get access. This is best for large ant infestations because it is effective at slowly poisoning the ants, so they have time to take the poison back to the colony and slowly infect all the ants in the colony. This makes this ant killer one of the best for controlling large populations and killing the colony at the core. One of the great features of this is the fact that you do not need to know precisely where the ant kill is to kill off the colony because the ants are going to do the work for you. Terro Liquid Killer is meant to be used outside so you can prevent the ants from ever even getting it. The bait stations have stakes on them, so they can be driven right into the ground. This ant killer is weatherproof and useful on all forms of household ants. This ant killer is meant to be placed at the perimeter of your home to prevent the ants from getting in through cracks in the foundations. To use this killer, you sprinkle the granules around the exterior of your home, and the worker ants eat the bait and take some back to the colony to slowly kill off the colony. This is effective at treating large infestations because it slowly kills off the entire colony due to the worker ants returning with the bait. Terro Outdoor Ant Granules are not effective on fire ants and beneficial insects like ladybugs and butterflies. These granules control ants, cockroaches, crickets, earwigs, silverfish, slugs, and snails as well. 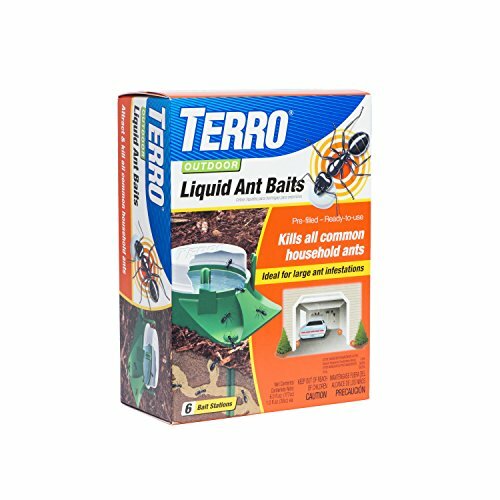 Terro products contain sweet ingredients that attract ants to the bait. The bait comes in a 2lb shaker bottle. This carpenter ant bait can get used in a variety of places that includes indoor and outdoor areas. 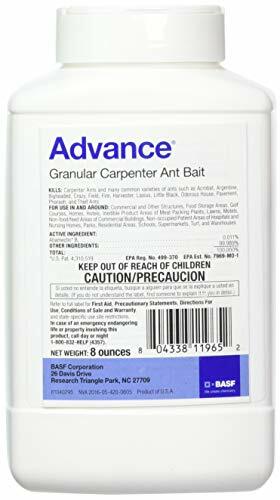 Advance Carpenter Ant Bait is effective when used in cracks and crevices because it slowly kills the worker ants which gives them a chance to take the bait back to their colony–this then kills off the rest of the population before the ants can get into your home. manufacturer claims that the special blend of protein-based attractants and large grit size attracts a larger form of carpenter ant. You can use this bait by sprinkling it throughout the yard, at the base of trees near the home, or sprinkle it right at the foundation perimeter of your home. This ant gel comes in a 27-gram tube and is effective at killing many different forms of pests including acrobat ants, Argentine, big-headed, cornfield, carpenter, honey, field, odorous house, pharaoh, pavement, and thief ants. The gel is made of a sweet bait that is meant to attract carpenter ants. The gel has a high moisture content that draws them in and once consumed the ants are killed off within three days. This also gives the worker ants a chance to bring the bait back to the colony and kill off the entire colony slowly to prevent the infestation from spreading to the inside of the home. 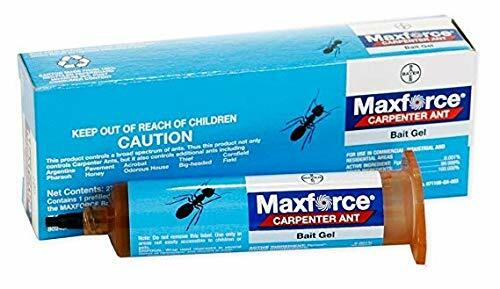 Maxforce Carpenter Ant Bait Gel is most effective when dabbed in small cracks and crevices. This can be done outdoors or indoors around furniture and in basements. The manufacturer recommends not using the gel wherever insecticides get sprayed because that will overpower the gel and make the ants unattracted to it. They also recommend using the gel between 10pm-4am when carpenter ants are most active. No one wants to have to treat their home for pests, but when you do there are a few things that will make the entire process easier for you and more effective. One of the significant first steps to take when tackling a carpenter ant infestation is to make sure you have the right type of ant. If you are sure you have a carpenter ant issue you will be better equipped to take care of them because each kind of ant has different things that attract it and make it easier to control. Here are a few ways to identify and control carpenter ants. What are Carpenter Ants Attracted To? Carpenter ants do not eat wood even though a lot of people think they do. They hollow out areas of dead and damp wood to make their nests. They create little passages known as ‘galleries,’ and if the area is left untreated for too long, they can do serious structural damage to the wood. This is the way that carpenter ants operate, and this is unlike any other type of ant. One significant way to tell if you have carpenter ants is to find their ‘galleries’ and look for an abundance of wood shavings on the outside. Since they do not eat the wood, they remove all the extra wood and leave it outside the hole. Carpenter ants’ nests are often near windows or doors so if you tap on the wall near the areas you think have a carpenter ant nest and you hear a rustling sound in the wall you may have a carpenter ant infestation in your home. If you are trying to take down a carpenter ant infestation–other than just spreading bait around you can do a few things to ensure they are attracted to it. The first thing you want to do is locate where a nest is in your home. You do not need to know exactly where it is but it helps to have a good idea, so you do not waste any time. If you are treating an indoor infestation, drill a few small holes where the ants are entering the wall and either spray an aerosol ant killer into the holes or cover the holes with a gel bait. Just be careful what you use when treating an indoor infestation around kids and animals. Preventing carpenter ants can be difficult, but the best way to avoid them is to stop them from getting into the home. The best way to control carpenter ants is with proper home maintenance. If you are afraid of having a re-infestation, take a look and see if you have any excess moisture or plumbing problems. These types of damp areas attract carpenter ants especially if it is within the walls of your home. Sealing up all openings in your home also prevents carpenter ants from getting in. Carpenter ants get in easily through cracks and crevices in the foundation, openings in windows, and cracks in doors. Make sure that your home is properly insulated as well to prevent carpenter ants from creeping in. If you have trees or shrubbery that touches the exterior of your home, try to maintain it and keep everything trimmed nicely. The ants can easily cross over from a touching tree to the inside of your home if the tree is untrimmed, so it doesn’t touch the house. This mistake is how infestations start even if you are not doing anything wrong. ensure that you do not miss any ants. Use a variety of baits-Each kind of infestation and situation requires a different treatment strategy and if you use multiple baits in various locations on your property, this will guarantee you cover everything necessary to destroy the infestation. Locate the nest first-If you locate exactly where the nest is in your home you can save yourself a lot of time, effort, and money because you do not have to waste bait on areas that are not going to be effective at treating the problem. Use a slow treatment method-The best way to kill off the entire colony and prevent yourself from ever having another infestation is to use a bait that does not kill the ant immediately. This allows the ants to take some of the bait back to the colony and kill off the rest of the colony and ultimately the queen. This strategy prevents you from having to worry about a re-infestation.